Paper wasp, bald headed wasp or the yellow jacket wasp…all bothersome and sometimes scary creatures. Summer brings along its fair share of worries, and wasps are one of them. We get a lot of call for wasp pest control during the warmer months. A sting from a wasp will bring the euphoria of a pleasant sunny day down to earth fast. The painful sensation travels to the brain at lightening speed. These small insects are easily agitated. So, when they inhabit your home, there is genuine cause for alarm. 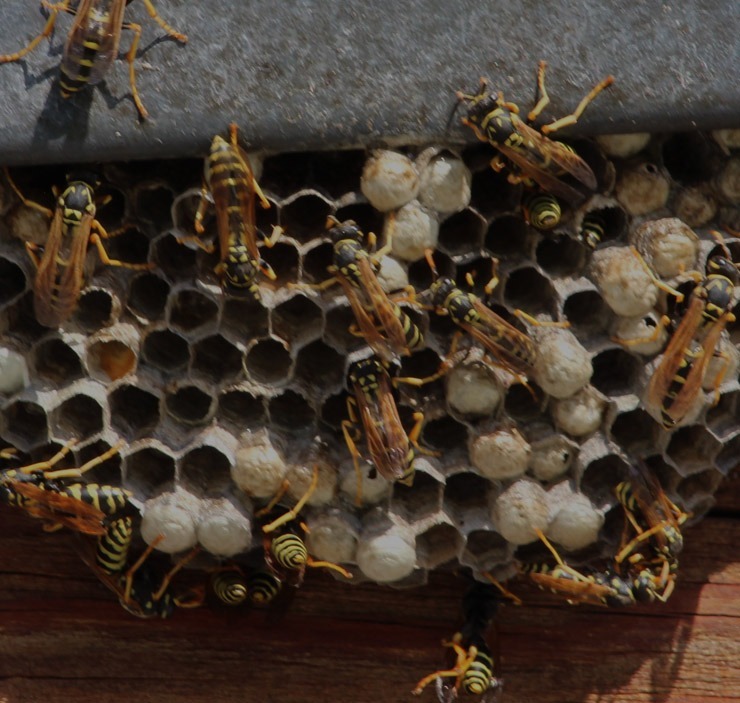 Like their cousins the bees, they live in colonies, but if a colony makes a nest in or around your home, you need a professional wasp removal service as soon as possible. A new wasp colony is formed by a mature queen, who makes a nest to house her brood by using saliva and wood. The group grows over time as they enlarge the nest, and before long the nest may be holding about a thousand individual insects. The worker wasps feed on nectar and other sugary materials, while in some cases they might eat larvae and assorted insects. If you do not get a wasps pest control professional to deal with the nest immediately, the colony will grow in situ and be even more cause for concern. It will not be hard to sport a wasps’ nest. They often set up home in lofts, in air vents, on roofs and under concrete roofs. You can also find them in many other places around your property, including in trees and outside walls of your garden. If you cannot see the nest but you notice a number of wasps buzzing around, you can assume it is possible you have wasp infestation. The wasps you see may be the workers and the guards. You may also notice them hovering over dustbins, dead animal bodies or waste depots. If after visiting all these kind of places they get into your food, they will certainly contaminate it. That is all the more reason to call professionals who are experienced with getting rid of wasps. First, our wasp pest control technicians will come to see you at home, so that they can find out just how infested your home is. If you can’t find the nest, they will find it and then they will ensure that you, your children and pets are safe before they can start exterminating the wasps. We offer one comprehensive, inexpensive package for wasp control London. And even after the first treatment, our technician will come back again for a follow-up to make sure that the pests were exterminated completely, and to teach you a few things about keeping pests away from your home for good. We are a phone call or an email away to offer you help for your wasp problems. If you do find the wasps’ nest, do not be tempted to try removing it on your own. Wasps’ main defence against attacks is to sting, which can be painful to children or cause serious inflammation in allergic people. It is best to leave the extermination to experienced experts who specialise in pest control for wasps. Do not risk suffering anaphylactic shock, which can occur even after one sting. As professional wasp exterminator technicians, we know how to take care of the wasps in every aspect of the process. How do we do it? We apply powder insecticide at the entrance of their nest at high pressure. The wasps carry the dust inside, leading to the demise of the inhabitants and their queen. Our wasps control treatment takes just 24 hours.